Welcome to Our Fork in the Road! We're at a crossroads in Oregon with regards to public education. On one side we have the corporate education reformers trying to push a business model for our children's education. This is funded by big money from the Billionaire Boy's Club and corporate hedge funds. Their goal is to ultimately, privatize education so they can reap the financial rewards and profit. On the other side, we have those who believe that public education needs to remain public and democratic. Leaders like Diane Ravitch, Anthony Cody, and Rita Solnet. Their goal is to provide a well-rounded and equitable education for every child in the state. To do this, the state must first and foremost provide the funding necessary, and then the state needs to trust its educators to teach. Our group was founded this summer when a group of concerned individuals started to say "no more" to the education reform movement and lack of funding that was happening here in Oregon. We are proud to say that we are a truly grassroots movement which has no budget nor any funding of any kind. We run on our dedication to making things better for all of Oregon's students. We have seen the education reform movement grow exponentially over the nation, and we soon recognized the signs that it was here in our state too. Since this summer, we have quickly organized ourselves into a group that has followed Oregon education policy as Oregon is working towards a fundamental shift of reform led by Governor Kitzhaber. This June the legislature passed many education reform bills that led to the creation of the Oregon Education Investment Board who would be responsible for creating a seamless, PreK-20 public education system. As our group met and grew, changes were already happening in Salem. First and foremost, a group called Learnworks was put together as the Governor's request to make recommendations to the OEIB in this redesign for our public education system. 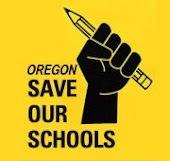 Sensing the urgency to make our group focused and official, we decided to call ourselves Oregon Save Our Schools as our beliefs aligned with those of the National Save Our Schools Guiding Principles. The national group held a march in Washington D.C in July 2011. Several of our members went prior to our existence as a group. We also became an affiliate with Parents Across America as we also aligned with their beliefs. However, our group is open to all: parents, teachers, grandparents, community members, etc. Still the point of our group is to provide a voice for those who really feel the direct effects of education policy in Oregon: teachers, parents, and students. Currently, those voices are being minimized as the OEIB and the NCLB Waiver Plan are being pushed through in such a way as to open the door wide for the Governor's education plan to become a reality. We at Oregon SOS don't agree with the direction our Governor wants to take. We see his plan as heading in the opposite direction of where we should be heading. We want and end to high-stakes tests that are used to evaluate the success of our schools, students, and teachers. We believe our schools need to have stable and adequate funding. We want our students to have a well-rounded curriculum with enriching programs. We want lower class sizes. We want a culture of trusting our teachers as professionals. We want education policy decisions to include and hear the voice of the public to include teachers, students, and parents. We have had members attend every OEIB meeting and offered testimony. Our biggest concerns have been lack of public input, lack of discussion for funding, focus on reform rather than funding, focus on business interests rather than students' interests, and rushing the process. Now we are analyzing the NCLB/ESEA waiver application, and we are extremely worried about what this plan puts in place for our state: achievement compacts, high-stakes testing, funding those schools that are successful, and intervening with those that aren't. With the legislature meeting the February, it seems this waiver plan--which in essence pushes forward Kitzhaber's education reform plan--may go through quickly and without much thought or discussion. If we want to improve our education system, we need to do it right and with much input, thought, and discussion, and time. We will keep you all updated on what is going on, so check back often. What can you do? Contact your legislators. Contact your school boards. Contact your union if you are at teacher. Talk to other parents, teachers, and people in your community. Read the documents in the OEIB Links we provided. Attend public meetings and speak out. We are small and determined, but it will take more than us to change the direction of public education reform in our state. Indeed we are at a crossroads, a tipping point, a fork in the road. It is up to us to decide our direction. We the people.